Spruce Mountain Ranch has selected not to acquire a liquor license, as a cost enefit to our clients. However, to help manage the liquor coming on and off the premises, we do require that you use Peak Beverage as your liquor vendor, and that ALL alcohol be served by TIPS trained bartenders also provided by Peak. How much money can I save on my bar at Spruce Mountain, compared to other venues that have a liquor license? A LOT! Recently, we did a cost comparison between Spruce Mountain and a Colorado venue with a liquor license that does not allow you to use Peak Beverage. The comparison was conducted from using a guest count of 160 people, and having a full bar for 5 hours. The average cost savings was between $4,000-$6,000! I make my own beer/wine/spirits; can I serve that at Spruce Mountain? Does Spruce Mountain offer any onsite AV services or equipment for weddings? No. We recommend utlizing your DJ, or an outside audio visual company for these services. Is there power at the outdoor ceremony sites for a sound system? Yes, all of our ceremony sites have power. Who do you recommend provide sound for our ceremony? Your DJ or band can typically provide a ceremony sound system for you, which may include a lapel mic for the officiant and groom, a wireless handheld mic for readers, singers, etc., and a PA sound system with recorded or live music capability. We are also happy to refer a company to you that can assist with your ceremony sound needs. 225 beautifully landscaped acres,11 consecutive hours of venue use, property manager, ceremony site, bridal cottage/loft, groom's lounge, tables and chairs for both ceremony and reception, 1 hour rehearsal, set-up and clean-up. Are there any "hidden" costs over and above the listed price of the venue? We have very simple and straightforward pricing. In addition to the cost of the venue fee, we require a $1,000.00 damage deposit which is due 30 days prior to your event. This damage deposit is 100% refundable, if no damages above normal wear and tear occur. We do not have additional service fees, or per person fees. Yes. However, no open flames are allowed. Candles can be used as long as they fall within these guidelines; flameless candles and/or drip less candles that are contained in glass are all acceptable. These include votive cups, hurricane lamps, lanterns, & floating candles. No. Due to the high fire danger of our area, this risk must be avoided. Yes. Only white "real" rose petals are allowed to be dropped outside. Any color of synthetic flower petals may be dropped inside. If “real” petals are to be used inside, they must be white, as to not stain the concrete areas. Can we hang lanterns, flowers, fabric, chandeliers, etc. from the tree at Grace's Chapel? No. To keep our tree in good health for many years to come, we ask that nothing be hung from the tree branches. However, we have built a trellis that has been secured to the tree from which you may hang décor items. Please be advised that this structure is not to be moved from its current position. Does Spruce Mountain own a ladder we can use to hang décor? Do you have the dimensions of your rooms, ceremony sites, ceremony site gazebos, Grace's Chapel trellis, etc.? I am trying to figure out the best room layout for my ceremony/reception. Can you assist me? Yes. Spruce Mountain has collaborated with AllSeated.com, to provide our clients with a free and easy tool to create room diagrams to scale. All of Spruce Mountain's floorplans have been uploaded to this site. Simply go to allseated.com to create your account and begin designing your spaces! I am looking for inspiration on how to decorate for my wedding. Do you have any photos of past weddings that I could use? Yes. We have a beautiful photo/video gallery on our website. In addition, we recommend following us on Facebook, Pinterest, Instagram and Twitter, and to read our weekly Blog. Also don't forget to "google" Spruce Mountain Weddings, to find our plublished weddings, and other Blogs that have been written about us. Event insurance is required by many ceremony and reception sites. Spruce Mountain has put this policy into place, to help protect our clients in the event they are held liable for property damage or bodily injury, as well for alcohol-related accidents. We require $1 million of general aggregate and $1 million per occurrence. In addition, if any alcohol will or may be served at your event you must have host liquor coverage. How do I purchase the liability insurance required by Spruce Mountain? This is a very simple process. We recommend going through a company called Wedsafe. Go to www.wedsafe.com, fill out the short application, pay the required amount (Typical cost is $175), email Spruce Mountain a copy of the certificate of liability, and you are done. The whole process takes about 15 minutes. Do you require a final walk-through? If so, when and how should we schedule this meeting? Yes. A final walk-through is required, and essential for creating a seamless event. Walk-throughs should be scheduled with your caterer, wedding planner, and Spruce Mountain representative only. If you have other vendors you feel necessary to meet with, please schedule them after the initial walk-through with your caterer, planner and Spruce Mountain rep. Walk-throughs should be scheduled no less than 14 days, no more than 30 days prior to your event. To schedule your walk-through, first contact your Spruce Mountain representative to learn of available dates and times, and then coordinate those times with your caterer and wedding planner. What do I need prepared for the walkthrough, and how long does a walk-through usually take? Do you have a partnership with any hotels in the area that offer lower rates for Spruce Mountain clients? Yes. Please contact us for a current list of hotels that offer Spruce Mountain clients special rates for room blocks. Do the hotels you recommend offer transportation to and from the ranch for our guests? Yes. We work with several hotels that not only offer discounted rates to our clients, but also provide a special hotel package that includes round-trip transportation to and from Spruce Mountain. Your guests will be very grateful that you have pre-arranged a hotel and transportation for them, and we have made this very easy for you to accomplish! Yes. We love animals! A ranch can be a dangerous place for domesticated pets. We need to make sure your dog stays safe and that Spruce Mountain's cattle are not put at risk. If you agree to keep your dog on a leash, clean-up their messes, and supervise them for the duration of the event, we will allow your dog to be a part of your wedding day. Dogs are welcome to spend the duration of the day in the groom's lounge area, but at no time will they be allowed in Ruby's Cottage. Your cows are so cute! Can my photographer and I go into the pastures to get a photo of/with them? Unfortunately, we cannot allow anyone access to our pastures. Our mama cows are very protective of their young, and by nature, will charge if they feel threatened. Startling the cattle can cause them injury. More importantly, we do not want any of our guests to be put at risk. Yes. Remember, you will also need to provide utensils, plates, glasses, wine bottle openers, etc. Our bridal cottage/loft and groom's lounges are not stocked with these items. Spruce Mountain is such a large property, how do you recommend I direct my guests once they arrive? 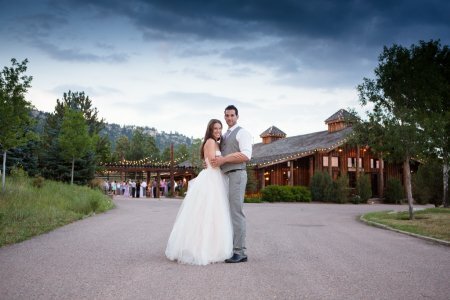 First, we recommend not only listing Spruce Mountain Ranch, but also listing the venue you will be having your event in, on all information sent to your guests and/or vendors. For example, you may list The Ponderosa Room, Albert's Lodge, or The Colorado Room, depending on which venue you have rented. Once your guests/ vendors arrive on the property, Spruce Mountain will have signage directing your guests to the correct venue. Do you have a property map and road map, I can include in my invitations to help direct my guests? Yes. You can download the pdfs from our website, or we can email them to you. In additon, we suggest your guests download our FREE App for access to our guest information page, which will provide them with directions, maps, and other helpful tips on attending a Spruce Mountain wedding. All rehearsals are held the day before the wedding from 9 am - 10 am. Please plan accordingly, as the rehearsal times cannot be adjusted, due to the schedules of our other events and cattle operations. 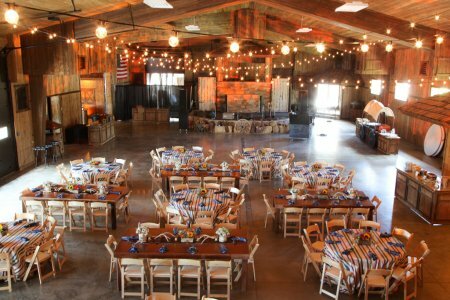 Do you have any packages to do a Rehearsal Brunch, after our rehearsal at the ranch? Does Spruce Mountain provide rentals such as linens, glassware, china, etc.? No. All rentals are handled by your caterer and ordered through our required vendor Event Rents. Can I purchase my own linens, glassware, china, etc. instead of renting them? Yes. You will need to coordinate the items you purchase with your caterer for set-up. However, please remember any additional items that you do not purchase and therefore rent, you must use our required vendor, Event Rents. Can you assist us in finding vendors for our event? Yes. We are here to assist you throughout the entire planning process. We will be happy to "customize" a vendor list for you based on your own personal needs. We will do our best to match vendors to you based on similar personality, style, and budget needs. This is a joint effort between Spruce Mountain’s staff, your caterer, and wedding planner. We do not want you lifting a finger on your wedding day. Leave the set-up and clean-up to all of us! Can I drop off décor items etc. before my 11 hour block begins? No. All set-up including deliveries are to be completed within your 11 hour block of time. Can I pick up my décor items etc. the day after my event? No. All items must be picked-up within your 11 hour block of time. Can my guests leave their vehicles on the property overnight? No. Spruce Mountain is a private gated property. Our front gate closes at the conclusion of our events, and do not re-open at regular times. If a guest leaves their vehicle, they are at risk of not having access to the property to retrieve it, the following morning. How many hours do we get the venue for a wedding? You get the venue for 11 hours. This includes set-up and clean-up. When does our 11 hour block of time begin, and what is the most popular 11 hour block of time? You get the property for any 11 hours you would like. We kindly ask that weddings conclude by midnight. The most popular 11 hour block is 1pm – midnight, with guests arriving at 4 pm, and the ceremony beginning at 4:30 pm. Please note that if you select the time block of 1 pm – Midnight, your ceremony time will automatically be set for 4:30 pm. What is the best way to break down the 11 hour time block for a wedding? 3 hours for set-up, 1 hour for the ceremony, 1-2 hours for cocktails, 4-5 hours for the reception, 1 hour for tear down. What time should I have my guests arrive to Spruce Mountain for my wedding, to keep us on schedule? The moment your 11 hour block begins, you and your vendors may have access to the property, no earlier. Yes. Please contact us to get current hourly rates. I have friends/family/vendors who would like to see where I will be getting married; can we come for a visit? Yes. We understand how exciting planning a wedding can be. However, please remember that Spruce Mountain is a privatively owned property, and walk-in visits are not allowed at any time. To visit, please request a "Visitors Pass" by contacting your Spruce Mountain representative. We will do our best to accommodate your request.